This album is an exploration of my voice through the bass, as well as a collaboration with some of my dearest musical mentors and friends. 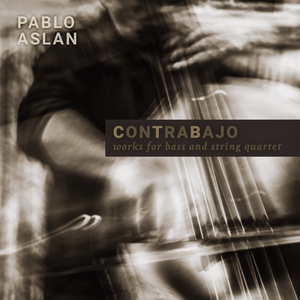 At the suggestion of bandoneonist, arranger, and composer Raúl Jaurena, I set out to create a body of work for bass and string quartet, in order to feature the bass not only as foundation and a melodic instrument, but as a driver of rhythm. As I was mulling over the idea, I got an invitation from Cho-Liang Lin, Artistic Director of the La Jolla Music Festival, to play a concert with Paquito D'Rivera and the Escher String Quartet in 2016. In turn, Pac-man, as he calls himself, invited me to bring some repertoire to the musical shindig, and thus the album was off to a start. I enlisted my teacher and friend Gabriel Senanes, who lives in Buenos Aires, to write and arrange several pieces. This led naturally to inviting him to be the Artistic Producer. He contributed two mini-concerti that sent me to the practice shed for months and forced me to up my game, a common thread throughout the making of this album. Gabriel and I set to work on both ends of the American continent. I commissioned pieces from close friends: Spanish bassist and composer Alexis Cuadrado explored the intersection of flamenco and tango, Raúl Jaurena evoked the spirit of the thousands of tangos we've played together over the decades, and Roger Davidson, a composer of beautiful melodies and a passionate tanguero, contributed a spirited New Tango. I was blessed with a long summer in Vinalhaven, Maine, to practice and prepare. Every day, as the sun came up, I would hear the fishermen's pickup trucks heading to Carver's Harbor for the day's work, so it was not hard to be motivated and get to the shed bright and early. Gabriel was writing and arranging in Buenos Aires, then rehearsing and recording with the first-class musicians of Cuarteto Petrus (Pablo Saraví, violín, Hernán Briático, violín, Adrián Felizia, viola, Gloria Pankaeva, violoncello) at the fabled ION Studios. After Maine, I continued working in my studio in Brooklyn and recording the solo parts with the inestimable help of Luis Bacque in his New Jersey studio. Paquito came over one afternoon in his 1957 Chevrolet to record his fantastic solos. Raúl and I recorded our performance first, and then had the quartet in Buenos Aires follow our tango quirks. The process was completed with a trip to Buenos Aires where we worked together with engineer (and editor!) extraordinaire Juan Belvis, who was the glue that kept us all together. When all was mixed and done, I had the chance to meet and enjoy the Petrus musicians in person, over pizza and red wine. This was a new way of doing things for me. I'm used to spending three days in the studio and "that's a wrap". In fact this process forced me, a performer, to understand the studio as a creative tool and an instrument in itself. Thanks to: Gabriel (te pasaste, eternamente agradecido), the Petrus "Fab Four" (Pablo, Hernán, Adrián, Gloria), Raúl (gracias por todo), Juan (The Fifth Beatle), Luis (the boss), Roger (for the love of music), Lito Vitale (que gusto volverte a ver! ), Fernando González (always a great help behind the scenes) and to my sweet love Alex (it's not nagging, but inspiration–thanks for pushing me). I got to know the music of Brazilian composer Heitor Villa-Lobos as a music student of Gabriel Senanes in my teens, in Buenos Aires. Over the years, I developed a love for the Latin-American classical guitar repertoire, as played by the great masters such as Andrés Segovia, John Williams, and Julian Bream, and by composer/performers such as Villa-Lobos and Agustín Barrios. I find this particular guitar sound–lyrical intimate, pulsating–to be one of the building blocks of my bass-playing style. The Villa-Lobos Preludes have been in my "desert island" list for decades. I've long imagined the first Prelude as a double bass piece, for obvious reasons: the melody is played in the low register of the guitar, and the accompaniment is in the higher strings. I only had to hum a couple of bars of this idea for Gabriel to know how to arrange the piece for this project. The remaining challenge was crafting an interpretation of the piece that followed the way this work is played by guitarists, including Villa-Lobos himself, which includes a very particular time-stretching approach highlighting the dramatic melody. When planning the repertoire for this recording, I thought of one of my closest friends and neighbors as an ideal partner: Spanish bassist and composer Alexis Cuadrado. "Confluencias" is one of the pieces that gushed out of Alexis. It's captivating music that builds as the theme gets tossed around the quintet, with rhythmic tension growing at each turn. As a composer with a jazz background, Alexis knows how to give the interpreter the freedom to create beyond what's written on the page. In this moody piece, Alexis asks the performer to create a background "ambient" using instrumental and electronic effects to blend in throughout the piece. I also took the liberty of adding the voice of the bass playing an improvised pizzicato in dialogue with the bowed melody and the tense background. When playing this piece, I was thinking of the "duende", that elusive spirit of Flamenco. The aim was to be a razor razor-sharp, and also a "cantaor" with something urgent to say. Some blues slipped into the final solo statement. I wrote this piece for my collaboration with the brilliant Cuban musician Paquito D'Rivera, and it was originally recorded on Tango Jazz, our joint album. Cuban music is an essential part of my musical identity, and "Tanguajira" evokes the feeling of the Cuban rhythm that is most dear to my heart, the guajira, and speaks of its relationship with tango. The slow swagger and particular swing of the guajira reminds me of the milonga, the seminal tango rhythm from the nineteenth century. Everything about this piece is a play on this relationship, which extends to my musical affinity with Paquito. For his solos I turned the bass into a "bowed tres". This is a technique I developed studying the arpeggiated patterns of the Cuban tres and adapting them to the bass. This is one of my favorite tangos by my old friend, the pianist and composer Roger Davidson. The melody is old fashioned, in the good sense. Soaring and singable, it evokes the sound of the tangos from the Golden Era of the 1940s and 50s. Over the years, I have worked as a producer on over a dozen albums of Roger's compositions, including tangos, bossa novas, klezmer music and jazz. He is an innate melodist with an uncanny talent for writing idiomatic tunes with a lot of spirit, a rare skill. The arrangement by Gabriel Senanes builds on the tango pathos of the original theme and takes it for a spin. I asked Roger to write a piece specially for this album and he responded with this piece in a dynamic "new tango" style. It features all the forward momentum of Astor Piazzolla's rhythmic innovations, plus the sweet directness of Roger's melodic writing. Roger's music has a way to distil the essence of a style without losing track of his own musical personality. I am especially thrilled by the cadenza in the center of the piece. Originally written for a concert I played at La Jolla Music Festival, where I premiered it with the Escher Quartet in 2016, "Contratango" is one of the pieces at the genesis of this album. It is a mini-concerto that explores a wide array of techniques, always put to good musical use. A long passage utilizing every practical natural harmonic on the bass turns the instrument into a sort of ocarina. The piece concludes with a variety of percussive effects using the body of the bass, all parts of the bow, and the open strings, to create a wild 7/8 tango. Bass players have explored turning bass into a drum before, but here it is an entire drum set played with all available means. Halfway through the making of this album, Gabriel started work on this multipart, Argentine folk-inspired extended work. It starts as a fierce chacarera, a rhythm traditionally written in 6/8, but here it alternates between 6/8 and 5/8 measures. The piece then morphs into a stately zamba, an Argentine folkloric dance of Afro-Peruvian descent. A hauntingly slow 3/4 rhythm plays with the "3 against 2" and its syncopations in the melody and accents. This feel is prevalent in Argentine folk, and I find that, at this slow tempo, it is the most seductive, perhaps because in a way it feels like tango. The zamba is followed by a tricky cadenza full of double stops, contrary motion counterpoint, and guitar-inspired moments, and finally returns to the devilish chacarera from the beginning. Riendo Suelto is a great addition to the concert repertoire for bass. I met Raúl Jaurena in New York City in 1988, and we have had a very fruitful 30-year relationship as musical and band-leading partners. We have travelled the world playing tango, and must have played "La cumparsita," the perennial Uruguayan classic, hundreds of times. He suggested that I record an album for bass and string quartet and motivated me to embark upon this journey. He also contributed his expressive bandoneón playing and the arrangement that closes the album. His writing reflects our many years of playing together, completing each other's musical sentences, and improvising off of each other's rhythmic and melodic ideas. I will always be grateful for his friendship and musical mentorship.